With HYPOXI on your dream trip in the luxury resort! In the period April to May 2017 all participants of the HYPOXI campaign “Beach Body” automatically entered in the raffle for a dream trip for 2 at the 5-Star-Deluxe-Resort VILA VITA PARC, Algarve! On June, 12th the winner was determined under lawyers supervision by lot. The happy winner is Mrs. Monika Kirves from Bochum. 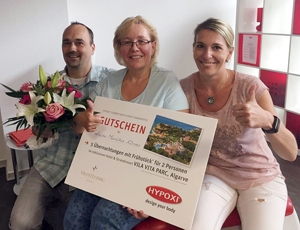 Mrs. Kirves feels optimally cared by the team of the HYPOXI-Studio Mülheim a. d. Ruhr and moreover she is pleased by her excellent results with the HYPOXI-Method. Mrs. Kirves was immensely happy when she was informed about being the lucky winner for the trip to the luxury resort “VILA VITA PARC”, in Portugal. She will enjoy the journey together with her husband.